Kohl Stewart made his second big league start Saturday night at Target Field. It didn’t go so well. The lineup flexed its muscles, socking four home runs. It wasn’t enough. The Tigers did a better job of taking advantage of opportunities, getting a huge three-run homer off Tyler Duffey, and ended up squeaking out a victory. I’d be willing to bet Stewart threw the lowest percentage of strikes any Twins starter has all season. I haven’t kept a running tally or anything, but 47.7 percent is awfully low. Nobody can be effective pitching like that, let alone a guy in his second major league start. Stewart has now given up six earned runs on eight hits and five walks over the first seven innings of his career. You’d have to imagine another young starter will get an opportunity the next time this rotation spot rolls around. Duffey was tasked with providing some length out of the bullpen. He only allowed four baserunners in his 2 1/3 innings of work. The problem was one of the hits was a three-run homer. Ouch. Tough to win a ballgame when you give up six runs in the first five innings. 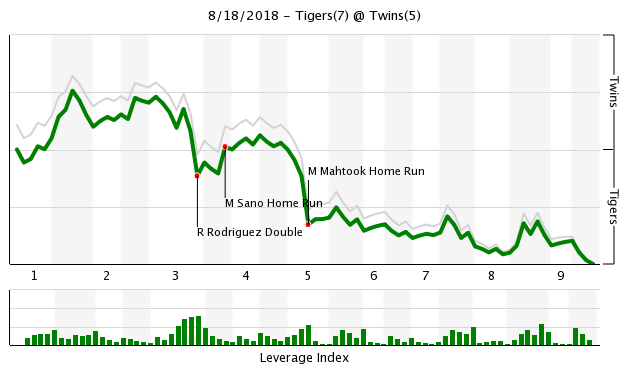 That three-run shot from Mikie Mahtook was Detroit’s only homer. 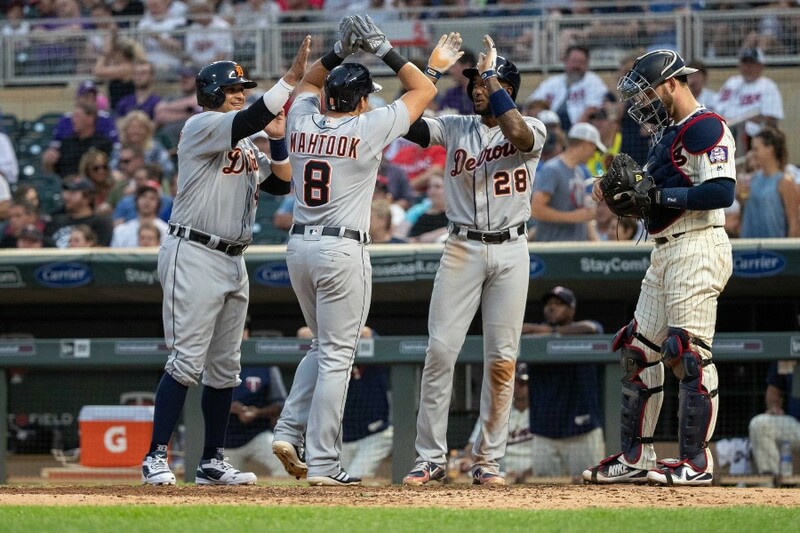 The Twins hit four homers — one each from Joe Mauer, Tyler Austin, Miguel Sano and Mitch Garver — but only got a grand total of five runs off them. After Duffey, the Twins’ bullpen was great. Trevor May pitched a perfect inning, Gabriel Moya shut out Detroit in his inning of work, Addison Reed gave up an unearned run in his frame and Oliver Drake pitched a perfect ninth. Anyone in the FO ever hear of Gonsalves?How about running out some more arms and pushing him back for no good reason?I am amazed at how the FO deals with our minor league players.By the way there is a LaMonte Wade who might be able to match what Field has done. Gonsalves, Romero, and Busenitz/J. Reed/Curtiss called up. But I also know Grossman and Belisle (*gags*) are rehabbing, so Robbie will need a spot, but they aren't seriously going to put Belisle back on the MLB roster, are they? Stewart will be replaced by some starter ready (Goncalves, I hope). Yes, will anyone claim Addison Reed and his $8 million or Ervin Santana? Time to cut bait. Sadly, Lamonte Wade will have to wait until next season, unless the Twins cut bait with Granite. But abck to Stewart...he will remain on the 40-man. But 2019 will be his decision year for sure. See if Thorpe passes him quickly in the pecking order. Anyone else notice that the Twins have 12 starters on their 40-man+ at the moment? That's my thing. There are plenty of people capable of going 0-10000 (roughly) like Field and company, let's give some young pieces who can actually be with the team in the future a chance. Hell I'd be more than happy to go out there and strike out 20 times in a row if that's what they're looking for. SIGN ME UP. Field DFA per Berardino. Now optioned (edit). Looks like the entire pen could use a breather. They should make a move or two to protect the arms in the pen. The game was lost tonite in the first inning. One run in, second and third, no out, and 4-5-6 hitters up. Did not score. Could have put some serious hurt on Detroit and it’s pitching staff. Could understand that happening with Sandy Koufax pitching, but not Carpenter. VERY DISAPPOINTING! You mean like every other organization? I don't think they're doing anything different than other organizations do. And remember this is Jeremy Zoll's first year as the minor league director, so it's difficult to know what his process is or will be. And, we're in year 2 of Falvine, but the first year of them being sellers at this point in August. Gonsalves is already on the 40-man roster, and arguably doesn't have as much "stuff" as Stewart. Wade isn't on the 40-man roster, has only been off the DL for 10 days or so. And he's left-handed and Field is right-handed and Grossman is a switch-hitter. Wade also is a prospect, so he should play every day. Maybe, but it's clear he's got some good stuff, and he's still just 23. He's got velocity. He's got movement. He's got 4 pitches. He should get more opportunities. If starting doesn't work, maybe he cuts down to 2 pitches (or 3) and moves to the bullpen. He's already well ahead of Appel. Belisle - the closer in waiting. Mike Berardino mentioned that Kohl Stewart had 7 swing and miss pitches out of 65 - about 10.8%.What is an above average MLB sw/miss rate? Of course, the problem with Kohl is that his control was so far off that not enough pitches were even available to be swung at and missed. I called this. The Twins brought him up too early and it shows. Gonsalves should of been the one to try out. He was having a much better year than Stewart. Seth your my guy, hell your all our guys...you've been doing this so long. You're wrong here tho. The old FO f'd up. Gonzalez s/b up now...silly. The've been wrong with Stewart and then did are w Jay. Let's just say TR and his crew **** the bed. BTW they did! It's been long enough to assess. It doesn't mean the new guys are tainted with that stain. Stewart and Jay are abject failures, good dudes but common TD has to be objective. Looks like Joe may finally be deciding to try to drive the ball. Never have understood why he didn't evolve into a slugger. Such a big strong man. Anyone in the FO ever hear of Gonsalves? But I'm gonna guess yes. Is Belisle actually on a rehab assignment yet? I haven't seen that. I am guessing if he returns, it will be after Sep. 1st and at least won't have any 25 man roster implications. It is really amazing to step back and note that Dave Winfield, Paul Molitor, Jack Morris and Joe Mauer are St. Paul natives who all played for the Twins and all had significant moments / milestones while a Twin, and three of the four are Hall of Famers, while the fourth may be. That’s not something you see every day. And now one is manager, one is a broadcaster, and extra cool that one played his whole career for the Twins. Remember in 2016 when the Twins brought up a kid who finished the season with an ERA of 8.02, a WHIP of 1.87, and opponents hit .310 against him? They should have admitted their mistake and dumped him too. Instead they kept using him and all he did was pitch in the All Star game this year. This is what this time of year is for if you are out of it. Perfect time to let a young guy struggle. I like what they have done with Stewart. The microscope will clearly illustrate what he needs to work on. If he wants it as bad as Berrios does he has a chance. 97 on the gun? Geez there is something to work with there. With him the struggle is learning to pitch. Learning to use his stuff. It was reported here he met with the brass this spring and was schooled on a new approach he is just implementing this year. Remember he was a football player too whereas with Gonsalves it has all been about pitching for a long time. I think with Gonsalves and his less overwhelming stuff he already knows how to pitch but the brass wants him to fine tune his command. They apparently feel he's not ready to take his lumps quite yet. We still could see him this fall. I've a good hunch some know it all's, I told you so's, will be disappointed when Gonsalves does get the call. I had never seen Stewart pitch before, so I was never sure what to think of him. I actually liked what I saw from Stewart. Obviously has some things to clean up. He definitely has potential to contribute at the major league level. Stewart got his two starts.That's a good beginning and intro to the big.But, now he needs to be sent back down and Gonz, Romero or Thorpe up.In a way not being in the playoff hunt is just what this team needs to evaluate before going into The Winter.We still have some dead wood still on this team that doesn't need to play everyday.Why wait till Sept or Next Year?